“For experts and observers around the world, it is clear that an ‘Arc of Instability’ is emerging across Africa’s Sahel which has opened a path for Al Qaeda to shift its center of gravity from Afghanistan and Pakistan to a new sanctuary and has created a potential launching pad much closer to US and European shores,” said Yonah Alexander, Inter-University Center for Terrorism Studies. Potomac Inst. North American bank National Bank Financial. Zaywa/AlifArabia (June 4, 2013) — Rising terrorism attacks on Africa’s infrastructure are raising the region’s risk levels and leading to concerns among international companies. The threat posed by Islamic militancy in Africa is a long-term issue and the risks should be taken seriously by investors on the continent, wrote Pierre Fournier, geopolitical analyst at North American bank National Bank Financial. Global powers are increasingly concerned by rising terrorism levels that is spreading across the continent, spanning the entire arc of Trans-Sahel region and beyond. With a new regional hub in Mali, Al Qaeda and its affiliates are presenting a strategic challenge to Western infrastructure and assets in allied countries. “For experts and observers around the world, it is clear that an ‘Arc of Instability’ is emerging across Africa’s Sahel which has opened a path for Al Qaeda to shift its center of gravity from Afghanistan and Pakistan to a new sanctuary and has created a potential launching pad much closer to US and European shores,” said Yonah Alexander, analyst at the Inter-University Center for Terrorism Studies. The attack on BP’s Amenas gas facility in Algeria in January saw 90 people dead including 37 hostages, and was the high profile terrorist event of the year in Africa. In April AFP reported al-Qaeda-linked extremists regrouping in Mali, S. Libya, and W. Sudan after France’s Mali intervention. Others reportedly went to Polisario-run camps in Algeria, among the locations recently cited by Carnegie (Perilous Desert) and IUCTS (Terrorism in N. Africa & the Sahel) as targets and hubs for terrorist recruiting and trafficking in region. 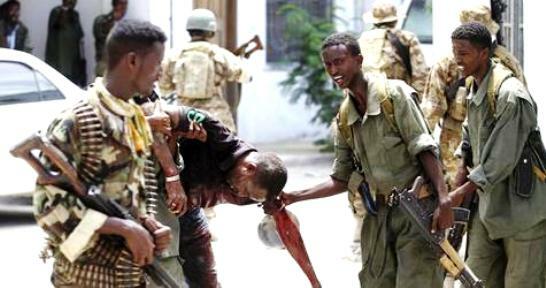 But the region has long been suffering from a steady of stream of attacks. The IUCTS report notes that terrorist attacks in the continent has grown from around 21 in 2001 to well over 150 each year since 2006. 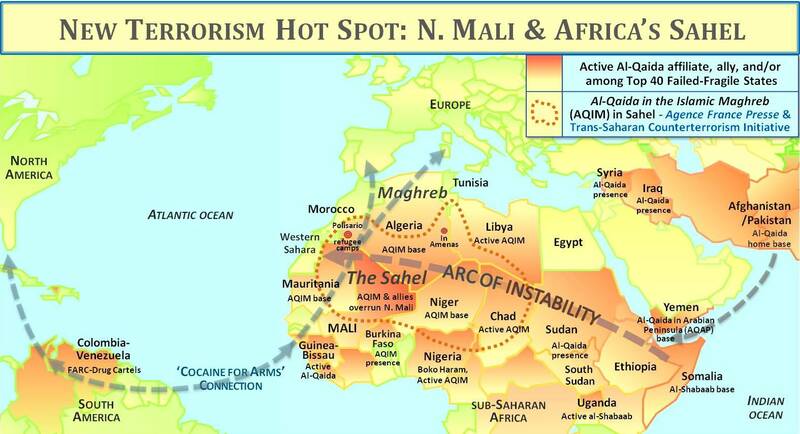 Certainly, the Amenas attack was orchestrated to show the Al Qaeda in the Islamic Maghreb (AQIM) prowess and deter investments in the country. Maplecroft, the risk management consultancy, considers much of Africa as either in an “extreme risk” or a “high risk” zone, and expects the terrorism problems to persist and spill over. “While the risk of terrorism remains highest in the north-eastern Kabylie region, recent attacks on strategic infrastructure have heightened security concerns in the southern and eastern provinces close to the border with Libya, Mali and Tunisia,” the consultancy said in a note. The problem is growing in places like Mali, Niger, Nigeria and elsewhere. On May 23, uranium producer Areva’s Somair mine near Arlit in Niger was the target of two suicide bomb attacks. “The collaborative and brazen nature of the attack on Somair suggests that despite the French-led intervention in northern Mali – or perhaps more accurately, because of it – radical Islamic militant groups continue to represent a serious and growing threat to Western business interests across much of Africa,” NBF’s Fournier noted. In the Trans-Sahara region, AQIM has taken advantage of a renewed Tuareg rebellion in northern Mali and a coup d’état in Bamako to overrun northern Mali – by joining with violent extremist mercenary fighters returning from Libya in the wake of the revolution there, notes the US State Department in a May 30 report on counter-terrorism efforts. The risk of terrorist attack and kidnap will likely rise, said Alasdair Reid, sub-Saharan Africa analyst from the AKE intelligence, a risk management consultancy. Meanwhile, Nigerian government forces have launched a concerted attack on fundamentalist group Boko Haram in the north-east, but analysts say it has only confirmed the army’s weakness and the rebel group’s unflinching resolve. If Nigeria, the regional stalwart with the most organized army is struggling to clamp down on terrorists, it does not bode well for the weaker regimes in the continent. Security risks are adding to the cost of doing business in Africa at a time when commodity prices are falling and global mining companies are especially keen on cutting costs. Despite its obvious promise, international investors continue to view Africa as a high-risk region which adds to its overheads and results in undermining the stock price of companies operating in the continent. The insurgents’ focus on high-profile Western interests such as mining sites, or oil and gas facilities, would make foreign investors especially vulnerable to such acts. “As these groups continue to flourish with growing impunity in the largely ungoverned Sahel, trans-national collaboration and cooperation will likely increase, and so too will the risks to Western investments,” Fournier said.